The weather has been so mixed up lately. One day it's beautiful and sunny, the next it's overcast with a chill. I never know exactly what to wear. However, this Rachel Zoe trench is usually a great choice. Plus, I always feel a little safari chic with it on. cute bag! love your shoes! The movie star glamour just keeps on coming! Love the jacket! So lovely! Whenever I visit your blog I always think it can't get any better, but the next time I always realize I was wrong. I really love the jacket with the sandals and boyfriendish jeans. You look stunning, as usual! I wish I could do my hair like yours.. Such a lovely outfit! I love your bag and these cute gold sandals. The gold tone shoes are so beautiful! That coat is perfection! She had a camel wool military-style coat last fall that I wanted in the worst way, but it sold out before I could get my hands on it...I still kick myself over that! Looking good:) I like that color on coats! That trench is SO chic. And I love the fun bag! Such a classy trench! And the heels with the satchel add a lovely amount of color! I am loving how classic your style has become in the last few months, Taylor! It looks effortless and elegant- perfect for a professional who knows how to have fun. This trench looks so cozy and fits you to a T. Rachel Zoe makes such beautiful pieces and I can't wait to get my hands on one of her bags! Perfect outfit for those chilly spring days. And I absolutely LOVE the bag! always so classy! Love the glasses! Those shoes are amazing! Love the heel. Rachel Zoe's line is so amazing, this trench is so chic and versatile, love the look! Not sure if I've ever seen a more beautiful trench... Hmm...definitely not! :o) It's perfect! Zoe definitley knows best, doesn't she? That trench is beyond awesome! I love how you've styled it. Of course my eyes are automitcally drawn to that FABULOUS Bramin bag- love! I also love the shoes.You defintley wouldn't be a "glitter girl" or the Taylor we all love w/out glammin' it up w/ a fabulous pair of shoes! Love this. i'm dying for that bag! i wantttt! love love love! you look so pretty - your hair looks especially perfect! love this outfit!and the bag is to die for! Very pretty, love the shoes! Love that purse! Soo cute! that rachel zoe trench is PERFECT for spring! you look gorgeous as usual taylor. Great jacket! Love love love Rachel Zoe! Rachel Zoe is amazing, therefore, so is this jacket. Cute bag, too! Great heels and bag. Lovely pictures. 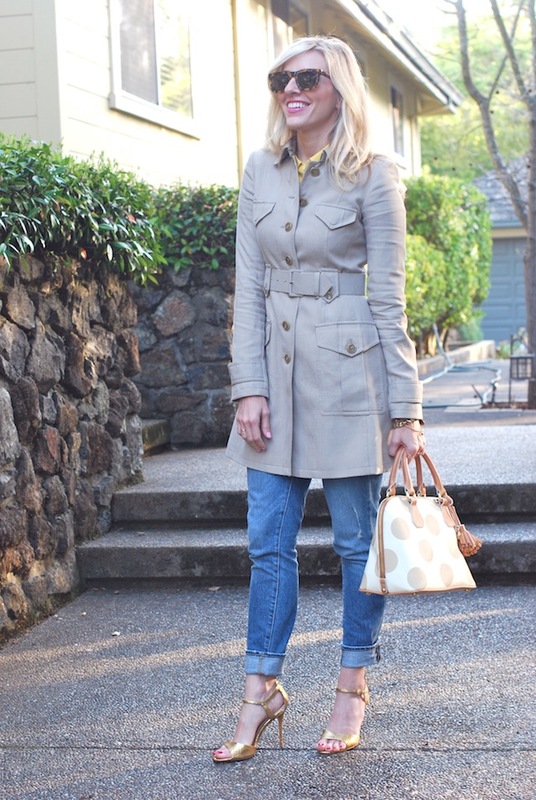 I love a good trench...and am downright obsessed with that Brahmin bag. Now that is a gorgeous and perfectly fitted trench. I've been on the hunt for one for awhile now. I love the mix of the girly gold heels when paired with a super structured coat like that --- so well done! I LOVE this look! It is so chic and that bag adds the perfect pop of fun! That coat is gorgeous! I don't really get a safari vibe from it, but more of a polished vibe! It really is very functional! Loving your bag too! Your bag is amazing and the pictures are great, I love the colors.